Recently I was having a chat with one of my cousins at a big family get-together. It was the first time I had seen them in a long time and we were having a really good catch-up. So, I got talking over a glass of prosecco with my cousins and a few other family members, about the times of 15% interest rates and how the more mature members of our family had to endure the 3 day week, 20% inflation and the threat of nuclear annihilation in 4 minutes .. so, foolishly, I said what with all the opportunities the younger generation has today, they had never had it so good! Trust one of my cousin’s to have gained some financial/economics qualifications before going to Law School, as they debated with me the genuine economic predicament of Millennials and how a combination of student debt, unemployment, global proliferation, EU migration and rising house values is reducing the salaries and outlook of masses of the UK’s younger generation, causing an unparalleled disparity of wealth between the generations. So of course I asked why that was? They said Millennials were paying the price for the UK’s most spectacular bookkeeping catastrophe to date (bigger than the Bank bailout after the Credit Crunch). Back in the 1950’s and 1960’s, nobody predicted us Brit’s would live as long as we do today, and in such abundant numbers. The OAP pensions that were promised in the past (be that Government State Pension or Company Final Salary Schemes) which appeared to be nothing fancy at the time, are now burdensomely over-lavish, and that is hurting the Millennials of today and will do so for years to come. Bringing it back to property, my cousin ‘soon to be’ lawyer, stated that baby boomers born between 1945 and 1965 have been big recipients of the vast rising house prices over the 1970’s/80’s/90’s and 2000’s. Add to that their decent pensions, meaning cumulatively, their wealth has grown exponentially through no skill of their own. This disparity of wealth between the older and younger generations could have unparalleled consequences for the living standards of younger Millennials…. So Houston Telford – do we have a problem?? Well Telford Property Blog readers, you know I like a challenge. I can’t disagree with some of what my cousin said, but there are always two sides to every story, so I thought I would do some homework on the matter .. Since 1990, the average value of a property in Telford has risen from £57,600 to its current level of £168,300. 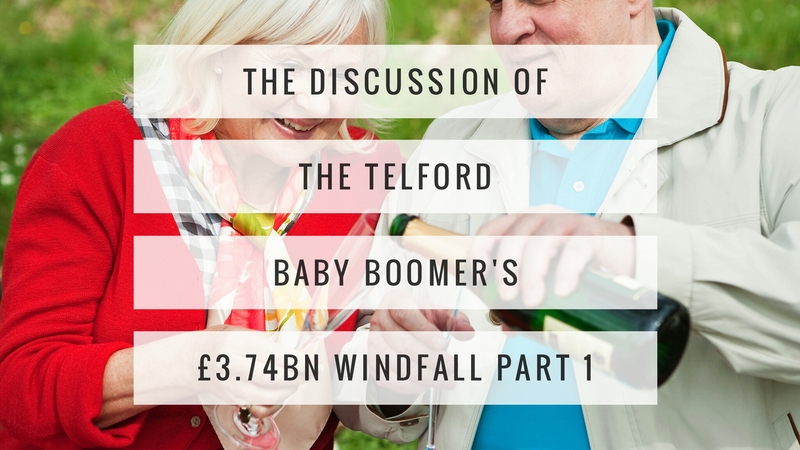 As there are a total of 31,336 homeowners aged over 50 in Telford; that means there has been a £3.47bn windfall for those Telford homeowners fortunate enough to own their own homes during the property boom of the 1990s and early 2000’s. 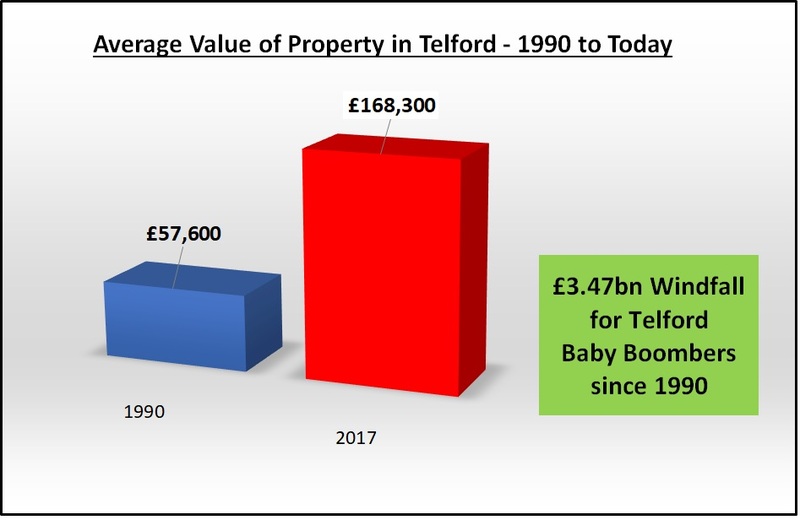 I must admit that the growth in property values in the 1990’s and 2000’s certainly helped many of Telford’s baby boomers. The figures do appear to put into reverse gear the perceived wisdom that each generation gets wealthier than the previous one … and so with all this wealth, the figures do back up my cousins argument that Millennials are being priced out of home ownership. Or do they? Are they? Next week, I will carry on this discussion where I will give the Baby Boomer’s defence to the prosecution’s case!